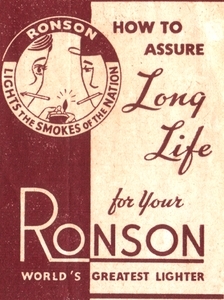 If you possess the first generation of the Ronson Penciliter manufactured between 1935 and 1948 and do not have the instruction booklet this post might be helpful to maintain your lighter in good shape. Refer to the diagram below for location of fuel chamber. Fill carefully with Ronsonol until wick shows signs of saturation. Shake out excess fuel. With cloth wipe working parts and body of lighter absolutely dry. Fill your lighter regularly. Do not wait until it runs dry. This causes wick to char. Always see that washer is in good condition. Refer to diagram below for location of flint screw. Remove screw and spring and drop out fragment of worn Flint. Insert new Flint into tube. Replace spring with screw but do not tighten till you have operated lighter several times to smooth rough edges of Flint. This ensures easier operation and relieves strain on working parts. Always keep wick extended 1/8 inch above the holder so that flame will burn easily. Trim off charred or frayed edges regularly. When flame dies quickly, your Ronson needs re-fueling. When wick fails to burn properly after re-fueling it should be replaced. Pull out old wick - do not attempt to unscrew wick-holder - remove old cotton wool. Insert new wick by pushing it through wick-holder, pull end of wick out at base, pack cotton wool tightly inside lighter and insert end of wick. Wick must be mingled with cotton wool or it will not be properly supplied with fuel. For best results change wick every few months. Clean flint wheel regularly, removing clogged accumulation on wheel with accompanying (or similar) stiff brush. (raise snuffer to expose flint wheel) Also regularly remove dust and dirt gathered under lighter mechanism around wick holder and inside snuffer cap. TO FUEL: Unscrew at point "A" and be sure that flint screw cap "C" is tight before filling. FOR EXTRA LEADS: Unscrew at "B" and remove ereaser disclosing magazine holding six spare leads. TO INSERT NEW LEAD: Turn tip as far as it will go to eject old lead. Turn tip back as far it will go. Insert new lead and press in gently till clutch engages. 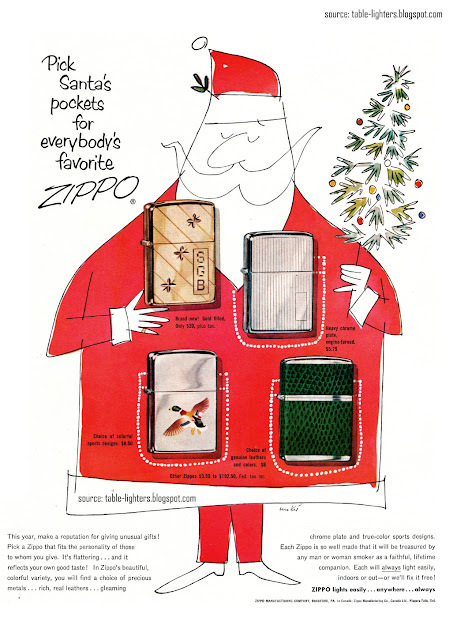 This Zippo vintage magazine advertisement was published in LIFE on December 1954. It presents a wide range of Zippo pocket lighters. Pick Santa's pockets for everybody's favorite ZIPPO!